While many Mac notebook users have been long awaiting refreshes for the MacBook Pro and MacBook Air lineups based on Intel's 6th-generation Core "Skylake" processors, a recently leaked April roadmap for Intel's processors beyond Skylake posted to the AnandTech forums raises questions about future updates for the 15-inch MacBook Pro in particular. The update bottleneck for future Mac notebooks is primarily related to the performance of Intel's integrated graphics, and it appears that an emphasis on processing cores over graphics by Intel may force Apple to make some changes to its graphics strategy down the road. The MacBook Air and 13-inch MacBook Pro run exclusively on integrated graphics bundled with Intel's chips, while since late 2013 the 15-inch MacBook Pro has come in two versions, a lower-end configuration with only integrated graphics and a higher-end configuration that adds a dedicated graphics chip for higher performance. 15-inch MacBook Pro models equipped with both types of graphics can automatically switch between the two depending on whether better performance or better battery life is required. Given the importance of integrated graphics for Apple's notebooks, Apple has typically used chips including Intel's "GT3" or "GT3e" tier for graphics performance, with the "e" suffix on GT3e denoting embedded DRAM on the chip for improved performance compared to the GT3 tier. These tiers are powerful enough to provide reasonably strong graphics performance for a notebook. Looking at Intel's roadmap for chips beyond Skylake, the 15-inch MacBook Pro runs into a problem as Intel appears to have no plans for any quad-core chips with integrated graphics higher than the "GT2" tier, which typically has about half the raw power of the GT3 tier, to be launched in the next-generation "Kaby Lake" processor family. As a result, the currently available Skylake "H-series" chips appropriate for the 15-inch MacBook Pro that we're expecting to see in an update as soon as next month may remain Intel's lead offerings for these types of high-performance mobile chips until the introduction of new "Coffee Lake" chips in the second quarter of 2018. Even then, initial Coffee Lake chips will include only GT2-level graphics that may not be powerful enough for Apple's needs. The situation is a bit better for the 13-inch MacBook Pro and the MacBook Air, which use 28-watt and 15-watt versions of the "U-series" processors respectively. 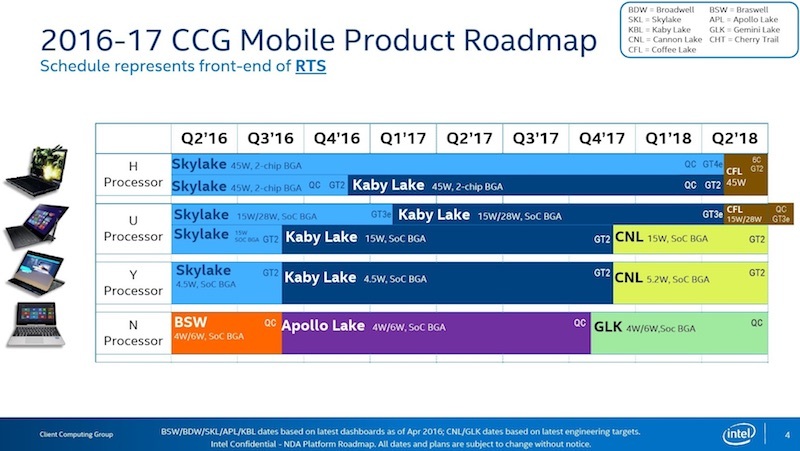 The leaked roadmap indicates that Kaby Lake versions of these chips with GT3e graphics are scheduled to launch in the first quarter of 2017, making them available for updated notebooks perhaps in the middle of next year following Skylake updates within the next month or two. Rounding out the Mac notebook lineup is the MacBook, which was updated in April with Skylake processors. Kaby Lake versions of those "Y-series" chips have already been launched, so they are ready to be used in next-generation MacBooks whenever Apple decides to release them. Those Kaby Lake Y-series chips will be part of Intel's lineup until late 2017 when new Cannon Lake chips based on a smaller 10 nm process are scheduled to debut. So what exactly is this Coffee Lake family coming in early 2018? As outlined by The Motley Fool, it appears to be based on the Cannon Lake architecture that has been under development for some time, but manufactured on the current 14 nm process rather than the next-generation 10 nm process of Cannon Lake. As a result, Coffee Lake would be Intel's fourth processor family to come from its 14 nm process, following Broadwell, Skylake, and Kaby Lake. It's not entirely clear how Apple will deal with the apparent high-end integrated graphics stagnation at Intel when it comes to future MacBook Pro updates, but there are a few possibilities including a return to dedicated graphics chips across the 15-inch MacBook Pro lineup or perhaps significant enough improvements in Intel's GT2 tier to make it a viable primary option for low-end configurations. It's possible Intel will also be able to release some additional "refresh" Skylake chips with faster CPU speeds to extend the lifecycle of that family, but there's only so much that can be squeezed out of the current design. With the MacBook Pro set to receive a redesign at its next update as soon as next month, Apple could also be planning larger changes to the machine's internals than the largely drop-in chip upgrades we've seen in recent years, a shakeup that could make predicting Apple's plans from Intel's roadmaps a bit more difficult. Here comes a thread filled with complaints over the lack of a new MBP and other new Macs. Because if we've learned one thing over the years, it's that complaining on MacRumors is how we get Apple to change things. Hopefully Apple will come up with solutions to this to suit everyone, but it seems clear their entire computer range is in need of updating, and it would be nice to think they'd been busy working on something special rather than just ignoring their existing line-up. Actually I would be happy if Apple updated the Mac's to today's processors, let alone worry about what is going to happen in 2018. Solution: Stop using ****** Intel graphics. Seems smart to just return to dedicated graphics. Seems most people would prefer it anyway. So it seems that Apple really should just go for dedicated graphics chips then. Apple is quite anti-GPU these days. If an Intel CPU doesn't have adequate integrated graphics, it will be skipped, because Apple won't reverse the path taken against discrete GPUs. I'd really wish that some major Apple customer would request a multimillion dollar shipment of Macs equipped with cutting-edge NVIDIA GPUs, but that kind of customers already moved to Linux. The main Mac user wears a watchie and chats with a phonie... that's the sad reality. HAHA what a BURN for the "waiting for kaby lake MBP" thread. Apple needs to do something, doing nothing has not helped them. Just sitting there waiting for Intel is not a good business strategy. Can't wait for these Baby Kale chips!